Since 2014 the new Eneco headquarters building in Rotterdam is in use. 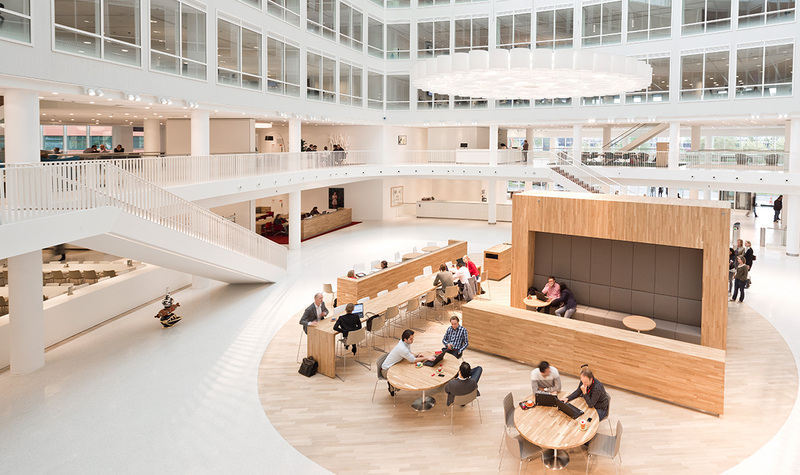 The 14-floor, 25,000m2 office offers a revolutionary, dynamic, open, sustainable and healthy work environment for the Eneco employees and visitors. The heart of the building is a central atrium surrounded by a light-filled meeting center with a reception space, meeting rooms, working areas, informal meeting areas, lounges, a restaurant, a service desk and an auditorium. Sun collectors on the south façade and on the roof track the sun throughout the day, absorbing the maximum amount of solar energy. The working and meeting areas are designed to be energetic islands floating on an otherwise calm, light-white terrazzo floor. Some islands are open spaces and others enclosed for privacy but they are all executed with vibrant colors and materials. Those on the ground floor are red, purple and orange, while those on the first floor are in different shades of verdant green (meeting rooms) and blue (working spaces). 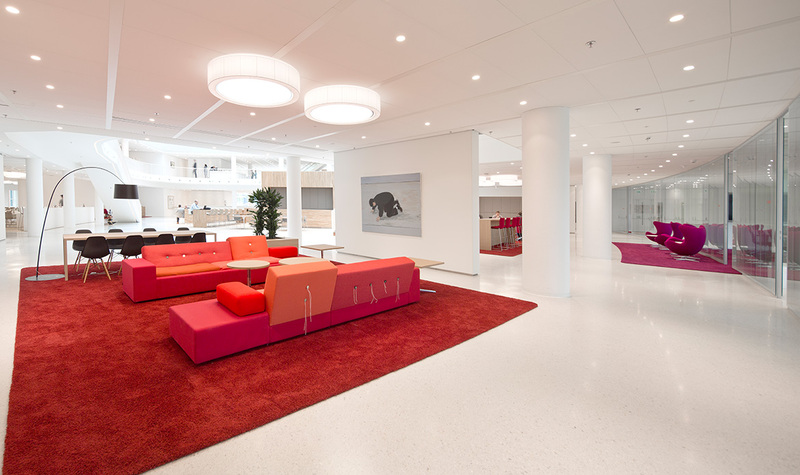 Employees are drawn to these colorful islands across the white floor and ‘land’ on them to undertake work and hold discussions. The diversity of color and materials on the work islands are not only lively and inviting but they give the different spaces specific identities and atmospheres that enable people to orientate themselves better in the office. 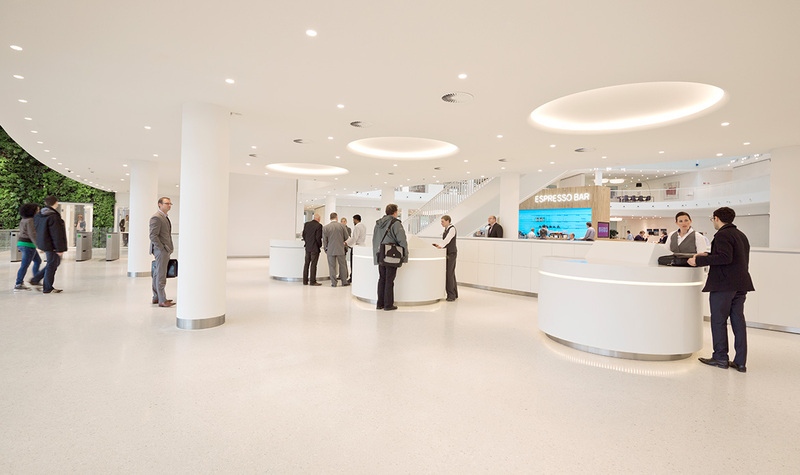 When arriving in the entrance hall, visitors are escorted by receptionists to one of the three Corian reception desks, making them feel they are arriving in a five-star hotel rather than an office building. This innovative piece of interior design reflects a new concept for hospitality that suits Eneco’s genuine generosity and focus on people. From the entrance, employees and visitors have a clear view of the centrally placed espresso bar – this is another island but one designed not so much with color but with relaxing blonde oak floors and tables, making a warm and inviting destination. From there, they can gaze up through the light-filled atrium and around the ground floor, orienting themselves. Also from here they can take one of the three dramatic and inviting staircases to the first floor. The ground floor meeting island has lush and vibrant red, purple, beige and orange carpets, equally colorful chairs and, as a calming contrast, subtle oak tables. To boost the design diversity further still, the beige carpets are furnished with white tables and chairs, and the entire experience is enhanced by lighting designed by Studio Rublek which brings out the rich hues and textures of the space. Also on the ground floor is the restaurant. With a dark ceiling, a dark terrazzo floor and dark Corian benches, the only bright color in this space is the food itself. Diners can watch the chefs creating delicious lunches and salads. For those who prefer a window seat for their lunch, there are clusters white tables and chairs on a bright white terrazzo floor adjacent to the black core of the restaurant. The brilliant whiteness reflects the maximum amount of daylight, making the restaurant full of natural light. Employees can reach the first floor via any of the three new dramatic, sweeping staircases in the atrium. In fact, the clever interior design of the building and the generous nature of the staircases encourages people to climb them and burn off a calorie or two rather than going for the lazier option of the elevator. The openness of the first floor keeps employees in touch with the airy central atrium and the buzzing espresso bar down below. The meeting centre on this floor is designed with a variety of green tones that grace the lounges, informal meeting areas, transparent meeting rooms and working areas. 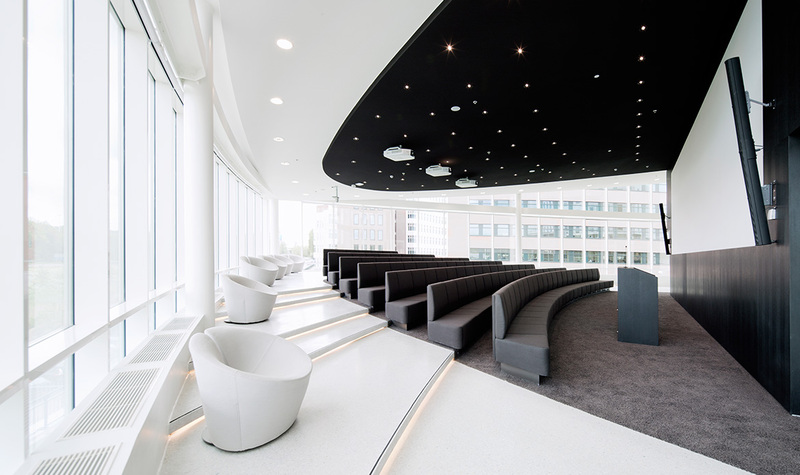 Staircases extensions reach a service area that boasts a Corian reception desk, a library area and a reading table. Crossing once more the staircase extensions, but still on the first floor, employees reach an open space with blue and turquoise islands with more lounges and working areas, and with small meeting rooms with experimental furniture such as Moooi sofas, Arper bar stools and ottomans, and Vitra Tipton rocking chairs. Behind these meeting rooms lies the auditorium, designed with deliberately dark tones to create a tranquil and intimate space for presentations. 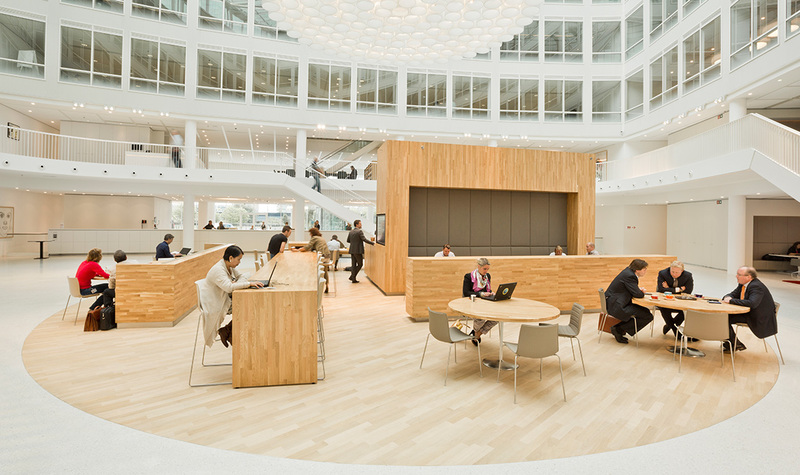 The creative and economical interior design of the new Eneco headquarters satisfies two of the company’s key principles: sustainability and the wellbeing of employees. At least 2,100 employees who used to work in six different locations have been brought together to work in this one amazing building, reducing travel between old offices and the carbon footprint. Due to the 0.7 flex factor, it is calculated that the 2,100 employees are never present in the one office at one time, due to sickness, work travel or holidays, so only 1,500 working desks are provided to serve the flexible daily workforce, making the building highly efficient. Those employees who need to travel locally on business use the suite of electric cars available in the garage under the building and to further reduce the footprint, the materials used by Hofman Dujardin Architects are of a high and durable quality ensuring the long-term use of the furniture, and all upholstery for the chairs and several walls carries an eco-label. Clear signs throughout the building leave employees in no doubt that garbage is collected separately for recycling and efficient disposal, and the sparkling lighting by Studio Rublek uses energy-saving LED light bulbs throughout the building, saving a large amount of energy. The wellbeing of the employee is centered on the new building being inspiring, spacious, diverse and light. Not only are employees encouraged to stay fit by climbing stairs, they are also tempted to cycle to work by the installation of a suite of state-of-the-art showers. The design gives employees a wide choice of places to work and meet, which means a flexible working environment without being fixed to one working desk. This reduces the monotony of the office environment and maximizes creativity and the potential for innovative thinking. There is a large diversity in working environments, from standard working desks to cubicles, concentration rooms (where one person can work in silence), work-benches for individual work, and team-tables, meeting rooms and informal meeting areas for collective productivity. The floors are designed so there is a balance between the open and the closed, the private and the public and the quiet and the dynamic. Each employee can select an atmosphere that suits his or her work activity. And, on top of everything else, there’s more oxygen to breathe to keep employees healthy and alert, courtesy of the fact that the green plant walls on the outside actually make their way inside at the third floor, bringing the natural world into the built world.